Happy Anniversary to Lindsay, our awesome and fearless illustrator, and to one of my favorite shops of all time, Sassy Studio Designs! Both are celebrating their fourth year together and I couldn't be happier for them! If you've been to my blog before, you know how much I love doing Sassy Studio Design new releases! This month's release is going to be such a blast, kind of a blast from the past, and we have such a fun release planned and I'm so excited to have you stop by! 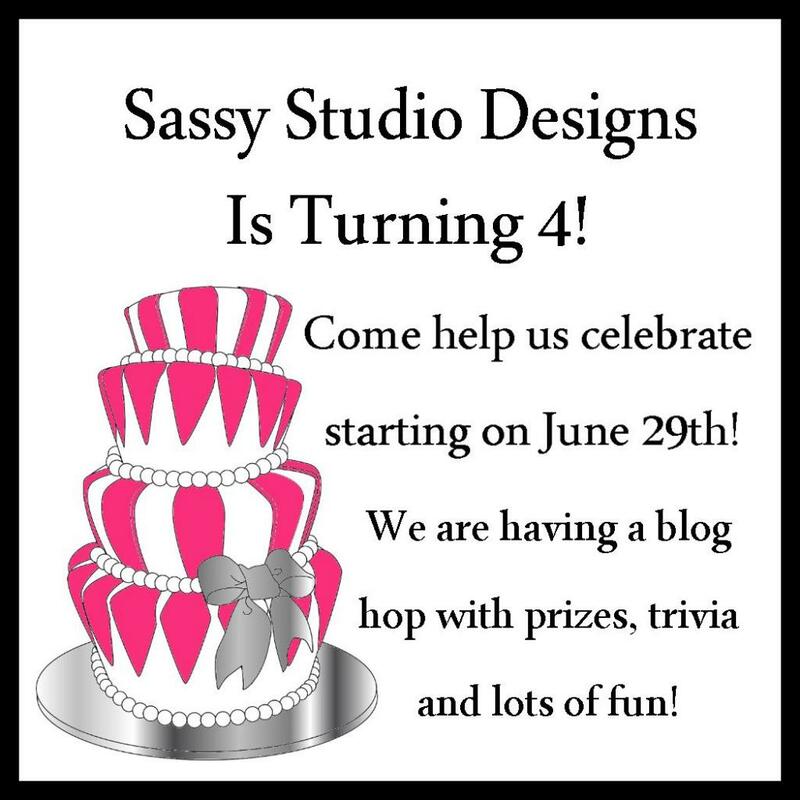 If you came to me from the Sassy Studio Design blog, then you're on the right track! If not, head on over to the blog and find out all the details and all the fun twists in this release! We each have an image and picked an anniversary and designed our projects around what is suggested as a gift for that particular year. I was so excited to get Tinkersassy and if you know my blog and of my love for Tinkerbell, you can see why I was so thrilled! Isn't she fabulous? See if you can figure out what year of anniversary I chose to celebrate. When I got assigned my image for this release, I was over the moon! The only thing was, I wasn't exactly sure how to get to the moon. I love to fly and if I could have a super power, it would be to be able to fly. 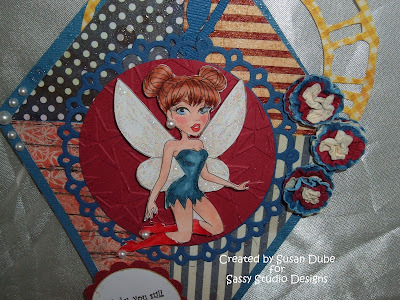 Well,I can't fly but Tinkerbell sure can! She can pick her own way of getting around and all it takes is a bit of pixie dust. We have to have cars with gas, or a bike or skates. Think of all the different ways we can get around. After so many years, don't you think a girl deserves to travel in style? Well, for her anniversary, I'd like to think that Peter Pan tried to make her travelling a little bit more comfortable for her. He got her a kite! Wasn't that thoughtful of him? It's got all the modern conveniences and gadgets. She's colored with copics and her wings are covered with Stickles or pixie dust as I like to call it. her kite is made up of scraps from BasicGrey and Graphic 45. She's all decked out with a clock so she'll be able to arrive on time and the kite is sprayed with Goose Bumps to give it some texture and protection from the night air. If you look closely behind her, she's got some stars embossed on her background that act as her GPS! The flowers and pearls are just because a girl needs something classy when she travels! Here's a close up of this beauty. I love her in red, white, and blue! I think it's appropriate for this time of the year. Here's a closer look at the flowers. I combined some patriotic colors and like how they came out. Here's a view of the tail. I used some baker's twine from The Twinery, and added some handmade flowers there as well. I know there's been a lot of pictures but I wanted you to see it all. 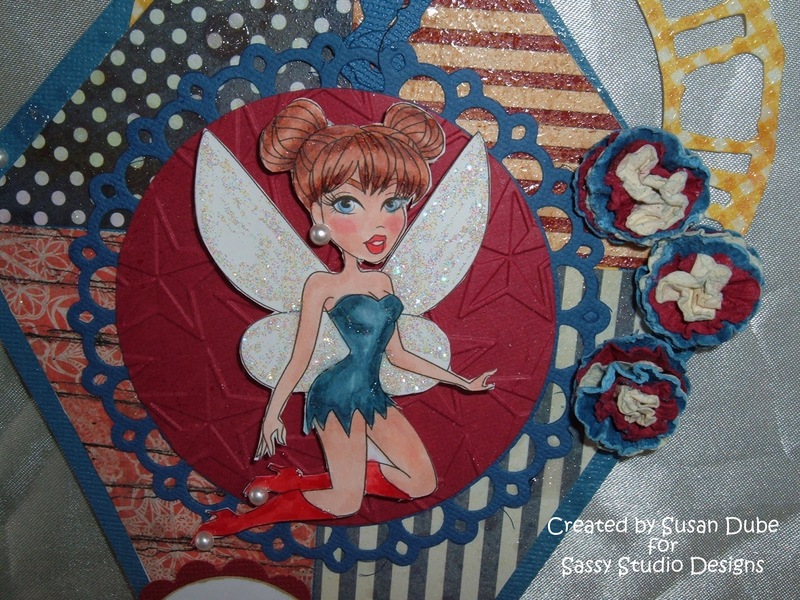 Now make sure to sprinkle a little pixie dust and fly on over and visit my totally awesome and totally cool designing sister, Sara, and see what great things she has in store for you. And remember to try and guess what anniversary each of of us are celebrating and leave a comment. I'm just dying to give this beauty away and let someone have as much fun as I've had! Love all the pictures and love the story that goes with this project. I'm going to say 43rd - travel. Love the kite Susan, great job. She's very cute. I love it. You said something about arriving on time so I'm going to say it's the 1st anniv. Beautifully done Susan. 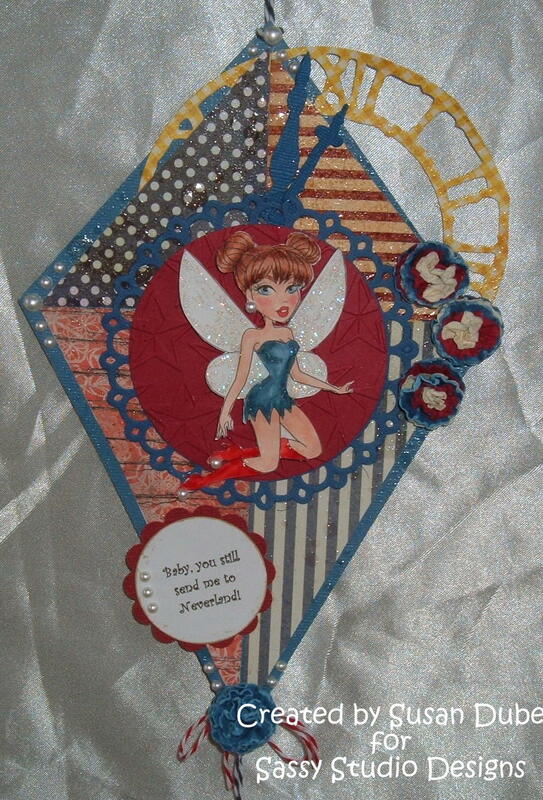 Love the kite and all the sparkle. It's just lovely. 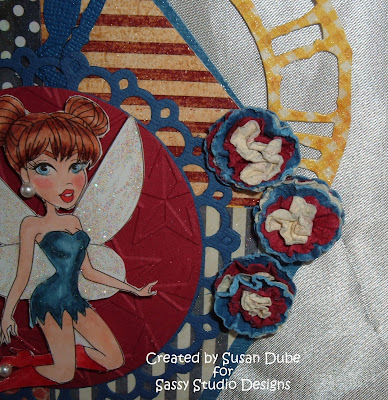 This is fabulous Susan - what a great form of transportation for Tink a kite! Susan...my sassy sister of bling! Very creative and FABULOUS! I always love your spin on creations. This is so gorgeous Susan! Susan, this is marvelous! What a fabulous project! Wonderful creation. Your card is stunning...I love everything about it. 236th anniversary is my guess!!! I just love all the detail and thought you put into this fabulous creation! What a neat project. So many cook elements. Love the sparkle. Oh, Susan she is just stunning! Love the glitter. I forgot to guess what anniversary I think maybe with the lovely pearls it is the 30th. Gorgeous coloring. I'm going to say diamond anniversary. WOW this is truly AMAZING! 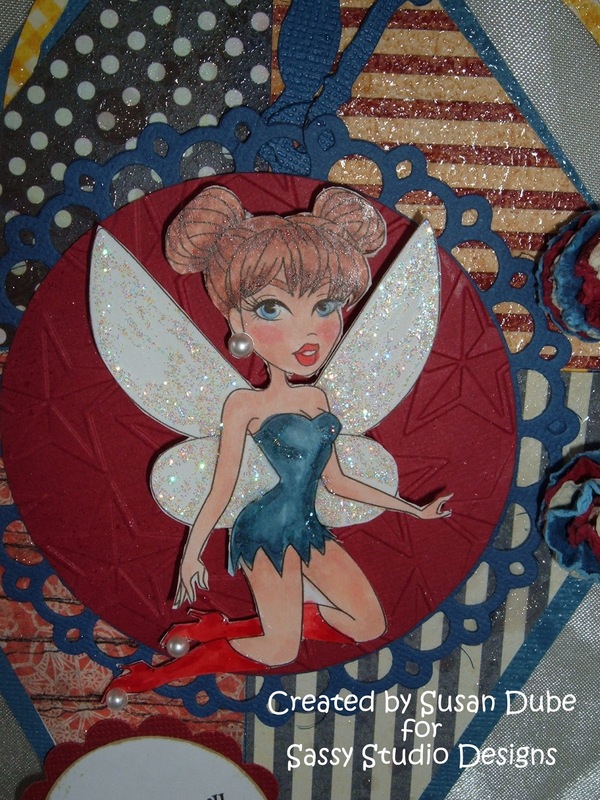 Your coloring is PERFECT and what a fabulous idea to put Tink on a Kite! Fabulous start to what I know will be an amazingly inspirational hop! THANKS! What a wonderful detailed card. I am going to guess 43rd travel too! So Pretty, I love all the bling. a cool and fab creation! Awesome kite! Perfect for Tink! Love the shimmer, and pearls you added to her outfit! Great job! I think it is a 1 year anniversary. wow, what a fabulous kite! I love all the detail work you have added. Thanks for joining us. 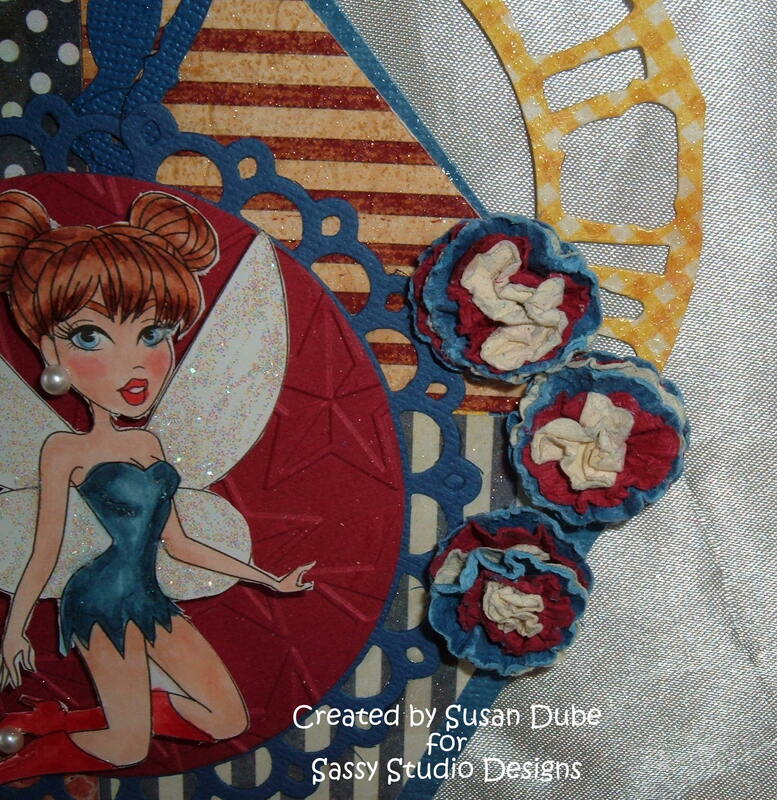 Awesome design work Susan! I hope you're feeling better very soon! Wow, this is absolutely amazing, Susan! What a brilliant idea with the kite! 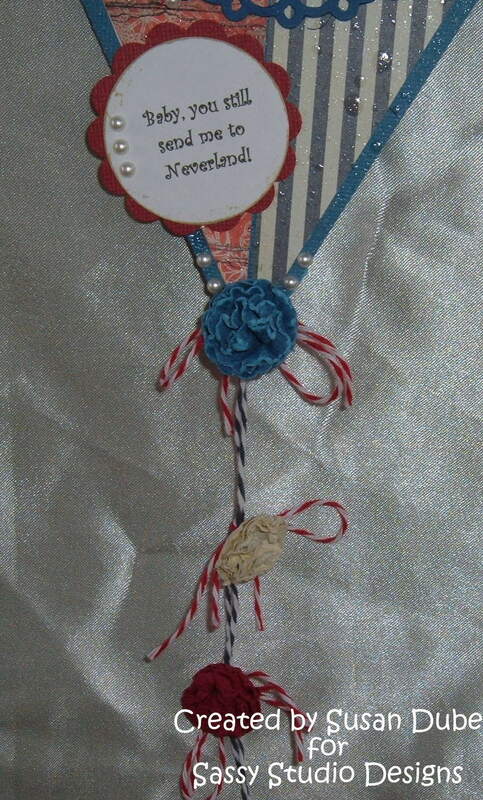 Love all your details and she does look fabulous in red, white, and blue! She is totally adorable, I love her glittery wings and her pearls! Thanks for joining us at Clearly iStamp for the colour challenge. Dawn Frost guest DT. Great image and beautiful make! Gorgeous! What a wonderful project! I love your post too. Lots of details in the kit. Nicely done.